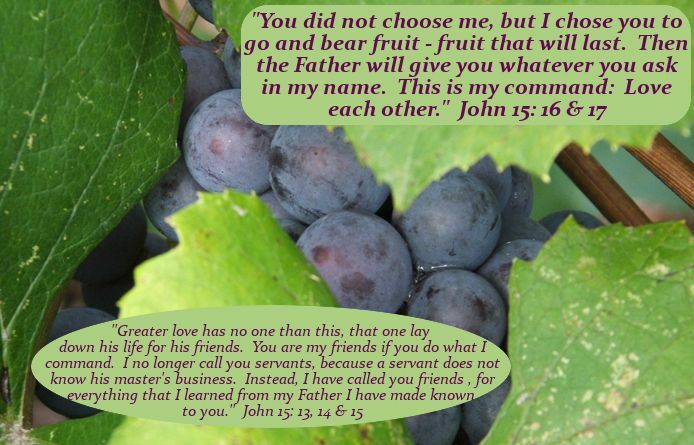 Today we are talking about Everlasting Fruit & Friends. "Bearing fruit and fruit that will last." It is almost harvest time and I am reminded of a wonderful pear tree that was just overflowing with perfect pears - so many that they couldn't all be harvested. I was proud of this tree and I wanted to make sure that this tree stayed healthy and fruitful - making sure that it had plenty of water and the proper nutrients. It is the same way with us - God provides us with all of the necessities to produce & live a fruitful life. When we are fruitful we can ask the Father for "whatever" in His name. Now remember - (this is very important)- asking must be in harmony with Christ's nature. God's nature and God's will should be our desire. These verses also talk about love. Love is not just a command but Love is an essential character to being a Christian. Christ's love is for everyone. We are filled with Jesus' love and and the proof of this comes from living a fruitful life. This "Greater love" that Jesus is talking about is of course the cross. Jesus gave up his life and died on the cross for us - This is our salvation. There is no greater love than this! The meaning of friend is: "a person whom one knows, likes and trusts." Just think about what friends can share - even secrets. We went from servants (in the Old Testament) to friends (in the New Testament). "For everything that I learned from my Father I have made known to you." It is interesting that Jesus used the word "everything." He did not just share the most important points with us or a few pieces of information but Jesus has shared everything that He learned from God. This is knowledge - knowing the Master's business. Jesus learned from his Father and taught us everything. Lord help us to focus on producing "Everlasting Fruit" and being an "Everlasting Friend"
Beat the Heat with this Cool Giveaway!